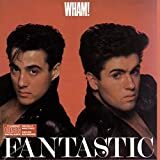 Am I Right - Onomatopoeia in Lyrics, Wham! Real Lyrics -> Onomatopoeia in Lyrics -> Wham! Wham! 's, "Wake Me Up Before You Go Go"
The sound of your heart pounding.